I hope that your club is working to win the Rotary Presidential Citation. Rotary President Ian Riseley is asking all clubs to strive to achieve it. I have contended that the Rotary Citation is easier to achieve than any citation presented during the past five years. I believe also that it presents a more level playing field for small, medium-size, and large clubs than recent Presidential Citations. It is membership-size neutral, but favors those clubs that systematically work toward achieving the necessary goals for winning it. To earn the citation, please complete all activities and report your accomplishment to Rotary before June 30. Where should you enter your club’s accomplishments? The 2017-18 Rotary Citation Achievement Guide on https://my.rotary.org/en/news-media/office-president/rotary-citation explains how and where to report each citation goal. How can Rotarians see your club’s progress? Club members who have my.rotary.org accounts can view their club’s citation dashboard by signing in to my.rotary.org. Then, under Manage, in Club & District Administration, go to Reports and, in the Awards section, you’ll see Rotary Citation. View the report for your type of club. 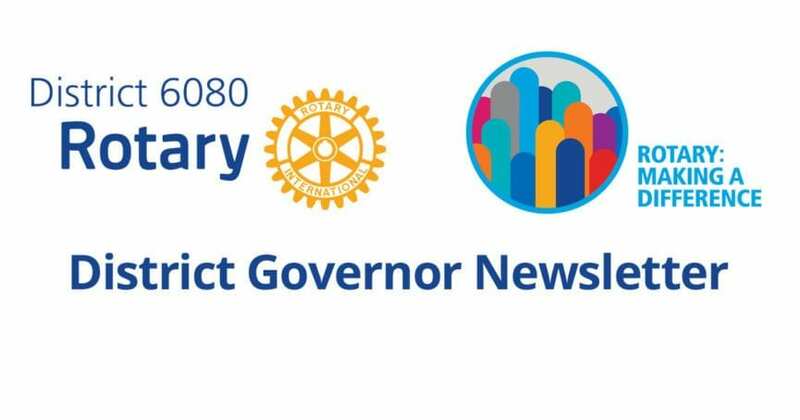 The goal in District 6080 is that at least 30 of the 50 clubs will win the Rotary Citation. Make sure that your club is one of the 30 and more clubs whose name will be called at the Fall District Conference to receive the coveted Rotary Citation. The Rotary Citation for Rotaract Clubs and the Rotary Citation for Interact Clubs includes goals that will help clubs keep members energized and attract new ones. The Rotaract Citation Achievement Guide and Interact Citation Achievement Guide, also found on https://my.rotary.org/en/newsmedia/ office-president/rotary-citation, explain where these achievements can be reported and how to view progress. Rotaract club presidents can view their dashboard report and make updates on my.rotary.org. All activities need to be completed before June 30. Interact clubs must also complete all activities by June 30. For clubs that have one sponsoring Rotary club, the sponsor club’s president must complete the online nomination form (https://rotary.qualtrics.com/jfe/form/SV_50WRcEopbghe3Qx) for the citation by August 15. For Interact clubs with more than one sponsor club, Rotarians should submit only one nomination. Nominations cannot be submitted by email, mail, or phone.